Buy from the grower and save! *Please to insure no delays fill in all required information. *Due to several increases in the cost of shipping over the past year we are adding a charge of $20 for each item shipped. *Note: A $3 winter insulation charge may apply depending on destination of flowers. *Packages are shipped farm fresh from Hawaii, via Federal Express. *Shipping days are Monday through Friday. Monday to Wednesdays are regular shipping days. Thursday and Friday require upgraded service. *A special handling fee of $14 is assessed by FedEx when recipient address is incomplete or incorrect. *Please inquire for shipping to Canada. *AK surcharges pending zip code. *Reserves right to substitute flowers. A beautiful assortment of 9 varieties of protea blossoms and foliage, already arranged. Seasonal. Three Birds of Paradise, three Red Ginger, six Anthuriums, three Dendrobium, Orchid Sprays, Tuberose for scent, a variety of Ti-leaves, and other tropical foliage. Already arranged!!! Combination of protea and tropical flowers. Arranged. One dozen protea blossoms and foliage (seasonal). Arranged in a unique handmade basket of coconut spike or with raffia. 9 stems of Protea blossoms with foliage. A splendid array of tropical and protea blossoms arranged. SPECTACULAR. 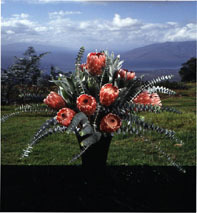 A five pound assortment of one dozen long stem protea flowers and foliage to create your own arrangement. Seasonal. A grand assortment of long Stem Bird of Paradise, Ginger, Anthurium Orchids, Heleconia, Tuberose, plus other tropical foliage. Combination of Protea, tropical Cut Flowers and Foliage. 25 stems of blossoms. One dozen dendrobium orchids and foliage. Made and handcrafted exclusive in Maui, Hawaii. Protea, eucalyptus, bayleaf, etc. One dozen Bird of Paradise plus foliage (not arranged). Fresh "Silver Dollar" Eucalyptus. Vase not included. Two dozen branches from 14 to 24 inches long that will fill a room with the scent of the woods. 1 dozen long stem assorted tropical flowers plus tropical foliage. Vibrant colors and long lasting. *Please to insure no delays, check to make sure all required information is fill in! OR just fill out, print and fax it to us at 1-808-878-6079. Please fax only the pages that apply to your order! !